A short trip back to Romania to visit the friends and family over there led to a road trip with one of my greatest friends, Ileana, and 6 of her friends up to the mountains for a couple of days. I’m not sure that the idea of sitting in a car for so long in such heat really was an amazing way to spend the weekend, but the views along the way, certainly made it all worth it. We headed out of Bucharest and up to our first destination for the night – a villa all to ourselves with some pretty impressive views of the mountains it must be said, and although we thought that we had been on the Transalpina, we found out that actually we had not yet officially started it or rather that there was waaaay more to come. We stayed in a small town which I guess in winter would be a small skiing resort called Ranca it is at 1,600m in the mountains and there were loads of new builds clearly getting ready for the winter season ahead. We went out for our evening meal, as soon as the sun went down the cold came in – it was pretty chilly. The views of the sunset were pretty impressive & it was great to have wi-Fi for a short while 😜. Walking back to the villa there was the most amazing lightening all over the valley I wish I could have stood still & filmed it – it was absolutely stunning, I’ve never seen such a view, a natural beauty. Back at the villa along came a mass of drinks & later in the evening Kareoke – hilarious!! But I think it was definitely a ‘you had to be there’ kind of funny! The twists and turns are quite something else. I have to say that I was not entirely enthusiastic about the choice of music for our journey – techno shite, sounded more like a kid plonking around on a hi tech piano but then each to their own! I pined for my shuffle to switch my head off from the mind numbing banging which was doing nothing to ease the headache which had been there since waking this morning. 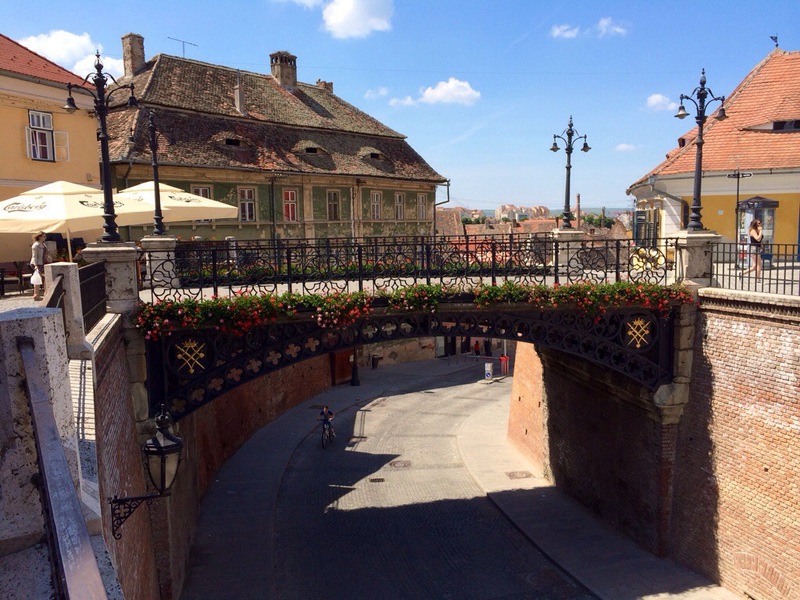 Sibiu, our stop off on the way home, is also known as Hermannstadt in German was founded in the 1190s almost bang slap in the centre of Romania and also in Transylvania. It had a large amount of German settlers even to this day there are around 2,000 still living there today. The old town is pretty spectacular with its wide cobbled streets. The majority of it has been pedestrianised since 2007 when it was a European City of culture. It’s been ranked by Forbes as being the 8th most idyllic places to live. The large square in the centre (Piata Mare) is where we stopped off for ice-cream, it was baking! Piata Mare is on of the largest of squares in Transylvania and surrounding the square are a number of important buildings from the 17th and 18th century. It is particularly beautiful. The naming of their squares was highly original with Piata Mica (small square) leading off the larger Piata Mare with further fairly impressive buildings surrounding the square. Ocnei Street sort of splits the square up and goes out under Liar’s Bridge, the first bridge in Romania made of cast iron way back in 1859. Legend has it that if you lie whilst on the bridge it will collapse, it becomes quite a place for wedding photographs to be taken and of course lovers to tell each other of their love. Although as Ceausescu once preached to the masses from the bridge, it’s blatantly not that legendary. Posted on June 14, 2014, in Europe, Romania 2014 and tagged romania, sibiu, transalpina way. Bookmark the permalink. Leave a comment.